In my previous post, I took a look at some of the scholarship about why certain articles are cited more than others. I feel bad, because by focusing on all of the little things that correlate with citation rate, I didn’t talk about the substantive aspects of how a citation is used. Sometimes a citation is used to simply say "I agree." Other times it may be used to say "You're wrong." Cue the next article I found by R.B. Williams (2011) about the history and classification of citation systems in the biosciences. This was an exciting article to read for two reasons. First, I had been looking for some information about the history of various citation styles for a while. (It isn’t easy. Try Google-ing “history of citation styles”). Second, the article made me aware of the scholarship about how citations are actually used within scientific documents. I am particularly drawn to the questions posed by Moravcsik and Murugesan back in 1975. Is the reference conceptual or operational? In other words, is the reference made in connection with a concept or theory that is used in the referring paper, or is it made in connection with a tool or physical technique used in the referring paper? The distinction is not meant to be a value judgment, and is not to be taken as synonymous with judging the importance of the paper referred to. Is the reference organic or perfunctory? In other words, is the reference truly needed for the understanding of the referring paper (or to the working out of the content of that paper), or is it mainly an acknowledgment that some other work in the same general area has been performed? Is the reference evolutionary or juxtapositional? In other words, is the referring paper built on the foundations provided by the reference, or is it an alternative to it? Is the reference confirmative or negational? In other words, is it claimed by the referring paper that the reference is correct, or is its correctness disputed? Incorrectness need not be claimed through an actual demonstration of an error in the paper referred to, but could also be established, for example, through inferior agreement with experimental data. First, these questions have a real importance when we start thinking about the ways in which citation metrics don’t necessarily get at the importance of scientific work. And second, I think there is some potential in these ideas to help students when they write term papers and cite their sources. Traditionally, I teach students that they need to cite their sources in order to acknowledge the scholarly work of others. I talk about the implications of not citing something (it was your own idea, its common knowledge, its plagiary), but I don’t really go into more detail about why you might cite something. By breaking down the purpose of a citation explicitly, as these questions do, perhaps we can better prepare students to effectively use the research articles they find in their term papers and projects. Now, I’m no expert on teaching writing. But the best term papers do an effective job of integrating the various sources they find into a cohesive narrative. Perhaps we could be more explicit about how this is done, and perhaps these ideas can help the students envision what their citations and their term paper might look like. Perhaps. Will this post be cited more often? Non-content factors that influence citation rates. 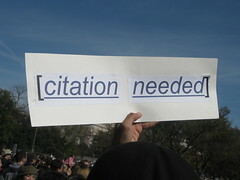 For many researchers, the citation is a make-or-break concept. Most ranking algorithms use citations to determine a journal’s influence or impact. Publication in “high impact” journals is often the key to tenure and promotion, and the number of times an article has been cited is often widely touted in tenure and promotion packets. With careers, funding and much else riding on citation, it would be useful for scholars and librarians to know why a particular item gets cited. We’d all like to think that the only reason an article is cited is because it’s content is relevant (and more relevant than other items) to the study at hand. Unfortunately, there is some evidence to suggest that other, non-content, factors influence the likelihood of an item being cited. Big caveat: The quality of these studies is highly variable and their results are sometimes contradictory. Correlation does not equal causation. Nevertheless, most of the non-content factors influencing citation rate relate to article discoverability. You can’t be cited if you can’t be read, and you can’t be read if you can’t be found. How likely is an article to be found in a database? Was the article discussed in a newspaper or other popular science forum? Does the title clearly explain what the article is about (and make you want to read more)? Is the article already connected to a wide circle of readers via multiple authors or large universities? 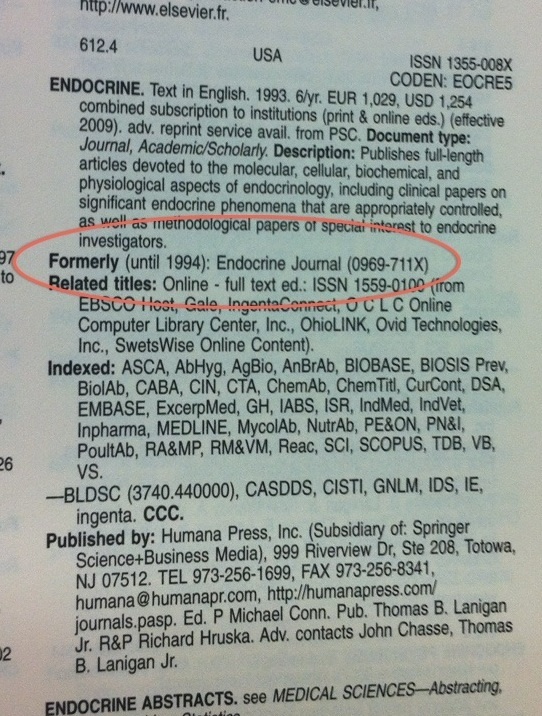 While there are classic examples of important scientific publications published in obscure journals, those are the exception and not the norm. A lot of research has looked into various aspects of article titles on subsequent citations. Type of title – In an interesting study looking at article titles from PLoS journals, Jamali and Nikzad (2011) wondered if the type of article title affected the citation rate of an article. In general, they found that article titles that asked a question were downloaded more but cited less than descriptive or declarative titles. Interestingly, Ball (2009) found that the number of such interrogative titles have increased 50% – 200% in the last 40 years. Length of title – Jamali and Nikzad suggest that articles with longer titles are downloaded and cited less, and Moore (2010) in a quick study found no correlation. However, Habibzadeh and Yadollahie (2010) suggested that longer titles are cited more (especially in high impact factor journals) and a positive correlation between article title length and citation rate was found by Jacques and Sabire (2009). Specific terms – Disciplinary abbreviations (very specific keywords) may lead to more citations (Moore, 2010), where as articles with specific country names in the title might be cited less (Jacques and Sabire, 2009). Humorous titles – To my disappointment, a study of articles with amusing titles in prestigious psychology journals by Sagi and Yechiam (2008) found that these articles were less likely to be cited than other articles with unfunny articles. Since funny titles are often less descriptive of the actual research, these articles could be more difficult to find in databases. Articles with funny titles, like this one featured on Discover's Discoblog, may not be cited as much as others. Number of authors – Leimu and Koricheva (2005) found a positive correlation between the number of authors and the number of citations in the ecological literature, while Kulkarni et al. (2007) found that group authorship in medical journals increased citation counts by 11.1. However, a blog post by Moore (2010) suggested that isn’t wasn’t the number of authors that were important, but their reputation. A recent study of the chemical literature that was able to account for article quality (as measured by reviewers rating) found a correlation with author reputation but no correlation to the number of authors (Bornmann et al. 2012). Industry relationship – Studying medial journals, Kulkarni et al. (2007) found that industry funded research that reported results beneficial to the industry (i.e. a medical device that worked or a drug that didn’t show harmful side effects) was more likely to be cited than non-instustry funded, negative research. Data sharing – Piwowar et al. (2007) found that within a specific scholarly community (cancer microarray clinical trial publications) free availability of research data let to a higher citation rate, independent of journal impact factor. Open Access – Lots of studies have been done with mixed results. A slightly higher number of studies seem to suggest that open access leads to higher citations (See the excellent review article by Wagner (2010)). Popular press coverage – It makes intuitive sense that journal articles spotlighted by the popular press might be cited more, but this is difficult to prove. Perhaps the press is merely good at identifying those articles that would be highly cited anyway. Phillips et. al (1991) were able to take advantage of an interesting situation when the New York Times went on strike in 1978 but continued to produce a “paper of record” that was never published. Phillips et. al. (1991) found that items written about in the “paper of record” but not published were no more likely to be cited than other articles. Length of your bibliography – A 2009 study by Webster et al. (2009) suggests a correlation between the length of an articles bibliography and the number of times it is later cited. They suggest a “I’ll cite you since you cited me” mentality, but online commentators suggest that this is merely a specious relationship (See Corbyn, 2010, and comments therein). So, if you want to publish a paper that gets the highest number of citations, what should you do? Do your study with a large number of prestigious co-authors. Submit your long article containing positive results and a big bibliography to a open access journal. Say something nice about a pharmaceutical company. Share your data and get the New York Times to write about it. Oh, and it might be useful to have some interesting and solid science in there somewhere. Almost all academic databases these days will allow you to export a properly formatted citation (APA, MLA, etc.) for a book or journal article within that database. This is a wonderful feature for undergraduates that saves a lot of really annoying formatting. It is especially helpful for eliminating the annoyance of re-arranging author first names and last names and putting in appropriate punctuation. Unfortunately, it doesn’t always come out perfectly. For example, the citation database Scopus regularly produces a citation indicating that an article is “Available from http://www.scopus.com&#8221; which is completely incorrect. Just the citation is available from Scopus, the full text of the item is found elsewhere. So in my library instruction sessions I regularly encourage students to double check the results of these citation generators (in databases, in web services like EasyBib and in programs like Mendeley and EndNote). So take a minute or two to look over your bibliography – you don’t want to look silly.